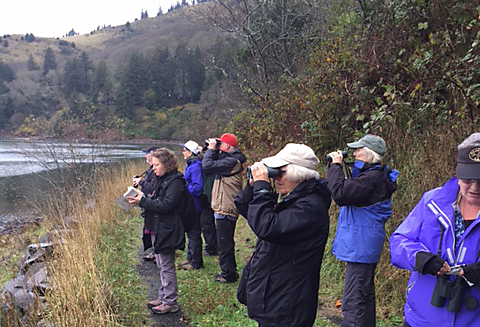 Coming from Otis, Lincoln City, Siletz, Depoe Bay, Idaho, Coos Bay, and Neskowin, 19 birders gathered in the CHR River House at 9am. 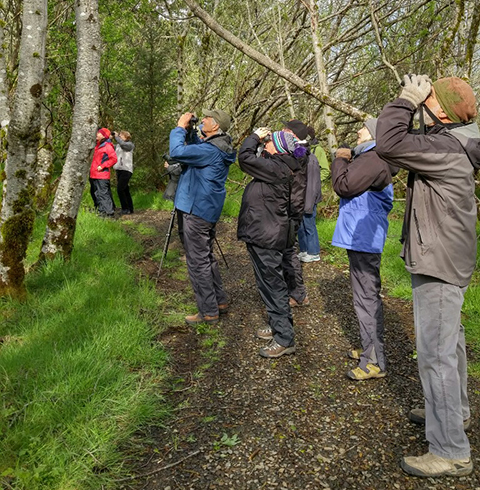 After a brief talk on bird photography by ASLC president Jack Doyle, all headed outside for the morning's bird walk along the shoreline of the Salmon River. 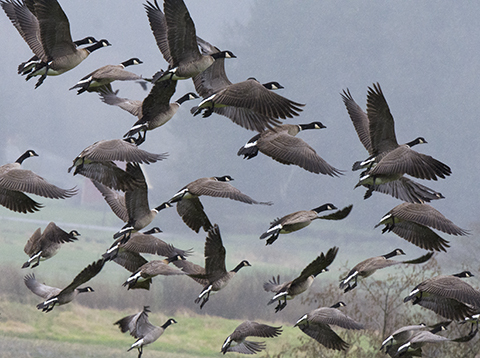 Twenty-one species of birds were sighted during the on-again/off-again drizzling morning. The weather and the lighting wasn't the best for bird photography but some birders managed to get some decent photos. Back in the River House, hot cider and cookies offered a welcoming respite from the damp outside. What a wonderful morning! 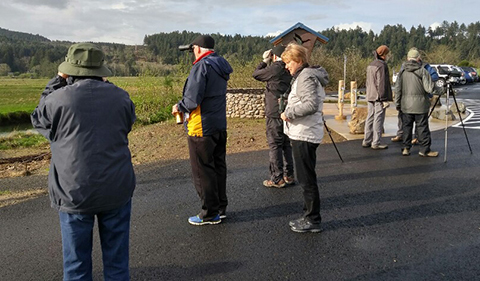 21 birders gathered in the parking lot of the Boiler Bay State Scenic Viewpoint for the ASLC bird walk, led by Mark Elliott. From Boiler Bay the birders caravanned past Depoe Bay, made a brief stop at Rocky Creek State Scenic Viewpoint, and further travelled to Devil's Punchbowl State Natural Area. Interesting birds that were sighted include Black Turnstone, Wandering Tattler, Surfbird and Harlequin Duck. Nine birders headed to Kilchis Point Reserve in Bay City. Immediately, we should tell you that if you are traveling north to locate it, you might bypass it since there is no directional signage telling you to turn west off of Hwy 101. However, you will find a sign as you head south from Garibaldi. Anyway, meeting and greeting each other at the parking lot, we began the walk along a very well-maintained path with numerous informational signs leading us to the bay. The weather was perfect and the camaraderie was excellent. Initially, we heard numerous American Robins squawking about something in their area. Soon, we saw the flash of a Great Horned Owl as it flew away from the ruckus. Many bird species were seen once we arrived at the bay opening. The tide was very low so shorebirds were quite a distance away but we did manage to identify several of them. 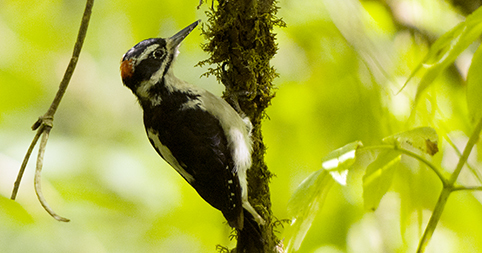 On our return trip, a Downy Woodpecker and a Hairy Woodpecker were sighted in close proximity. All in all, it was a pleasant, relaxing and enjoyable walk. A county park just a ways off the main road was a pleasant surprise to 16 birders that joined our outing. The morning was warm and the shade of the Bigleaf Maple and Oregon white oak trees hosted a variety of species that we don't usually see on the Oregon Coast. It was a clear, sunny morning as we gathered in the parking lot of Buell County Park, a location that was not familiar to many who came. 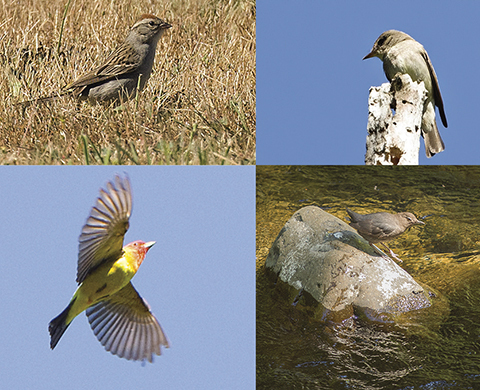 As a Great Blue Heron squawked in retreat, binoculars were focused on Willow Flycatchers, Chipping Sparrows, and the brightly-colored Western Tanager. At Mill Creek Park, on the other side of Hwy 22, we had another sighting of the Western Tanager as well as Cedar Waxwings. Moving about half a mile from the park we stopped along the creek for any new sightings. And there it was! An American Dipper wading in the water and stopping on a rock long enough for a photo op!! We couldn't have asked for a better morning for a bird walk! The weather was a question mark for our Saturday morning bird walk at Yaquina Head Outstanding Natural Area. As it turned out we had another beautiful bird walk with very little wind and 14 fellow birders. We were not disappointed by the action of resident Peregrine Falcons as they fed two young birds. Our walk to the rocks below showed us that the eagles and the gulls have taken toll on the Common Murre population. Very few birds were nesting on the rocks surrounding the lighthouse and we saw at least three eagles close by. With the recent weather giving us nothing but downpours one would think Saturday's bird walk would be a no show. Instead everyone was pleasantly surprised by the fact there was very little rain and 11 people showed up for the event, including two couples from Vancouver, Washington! 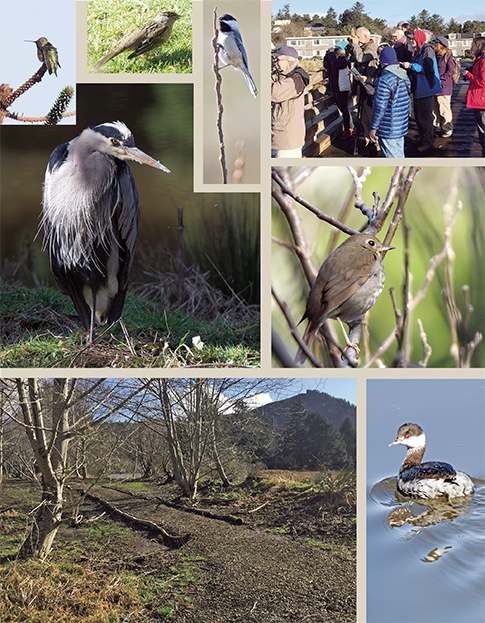 While the rest of Lincoln City was experiencing rain and hail, 15 birders walked the Alder Island Nature Trail at the Siletz Bay National Wildlife Refuge in the sun. We watched 8-10 Great Blue Herons flying in and out of the alders some with nesting materials in their beaks. Music of the songbirds filled the air and added to the beauty of the sun-filled morning. Despite the lovely rain that fell, 15 determined birders showed up at the Nestucca Wildlife Refuge. We could see and hear signs of Spring everywhere including the return of the Turkey Vulture. The dark, rainy weather kept us from getting many photos to post!! Today was the first blue sky day we have had in a long time. It lasted all day and 25 birders came and took advantage of the sunshine and birds. While we were waiting for everyone to gather, all eyes went to the sky to see two immature and one mature Bald Eagles. To top that off a sighting of a Barn Swallow and Tree Swallows surprised us with their early arrival to the area. We gathered for our monthly Audubon field trip led by Mark Elliott at the Hatfield Marine Science Center. For a change, it was a bright sunny day but with a pretty good east wind that brought the temperature down to about 25 degrees! About 20 people braved the weather in search of birds that winter over in this bay. After scouting the bay loop trail, without seeing anything out of the norm, we all jumped in our cars to warm up and drive the short distance to the south jetty in the bay. Here we saw a flotilla of Western Grebes which were very close to the road. A short distance further down the jetty we spotted male and female Long-tailed Ducks. These ducks are not uncommon at this time of year but seldom seen. It was a first sighting for most of us.